In ancient Rome, an Augur would determine the will of the gods by studying the flight of birds. He would note if they flew alone or in groups, the direction that they flew, how they sang in the air. And then he would decide if the signs were favorable, if everything in war and peace, at home and abroad, seemed auspicious. Throughout history and across the world, birds have symbolized something bigger than themselves. They signify peace, faith, night, wisdom and grace. They might be an ill omen of death or war. Ravens and crows are tricksters of fable, and larks signal the morning to lovers reluctant to part. From Poe’s raven to Ben Franklin’s turkey, birds have become characters in stories and myths, often representing the way that we look at the world and define ourselves. To birdwatchers, seeing new and wonderful birds is an indication of summer, of life returning to the world and then teeming with abundance. The opportunity to see or hear a bird represents a rare glimpse into the wildly, sweetly beating heart of the natural world around us. No wonder, then, that birds are a favorite subject for artists. Their nests, their feathers, their form, their flights, have provided endless inspiration throughout history, and continue to do so today. Kris Peter is an Australian watercolour artist who shows us the beauty of natural objects - shells and rocks, birds and their feathers, a segment of tree trunk or a simple gumleaf. 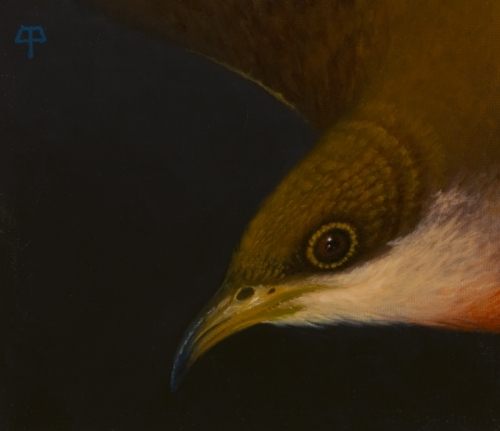 Her bird paintings suggest the strength and delicacy of birds’ bodies. 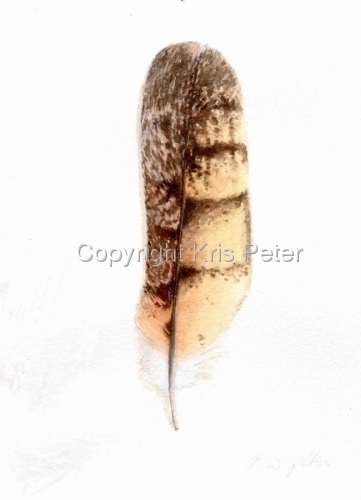 Her painting Like Vellum, Masked Owl Feather is a beautiful study of a single owl feather, at once simple and complex. Camille Feinberg describes the act of looking at one of her paintings in words that could just as easily apply to the motions of a bird. “Gazing at these vistas the eye searches for safe places to land while each perch quickly turn into visual roller-coaster rides soon after touchdown. Amid the cascade of shifting perspectives, the imagination hovers in transitory states of being here, there and everywhere.” Bird is a suggestion of a bird, a suggestion of earth and air. The figure of the bird is simple and perfect, at once full of distinct personality and a symbol of songbirds everywhere. 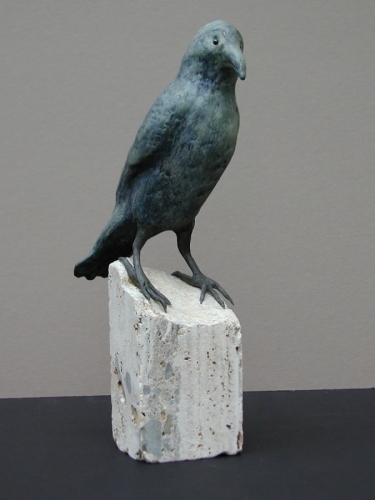 Her artwork displays a nice balance of depth and humor, and this is apparent in her sculptures of birds, which are well-executed and whimsical. Her raven has an appealing face, and seems poised to enter into some mischief or other. He is made of earthenware clay with encaustic glaze, constructed wire feet, travertine marble base, solid and grounded, but prepared to fly away. Jody Kaiser seems to have a real affection for her bird-subjects. She fills them with personality and life. 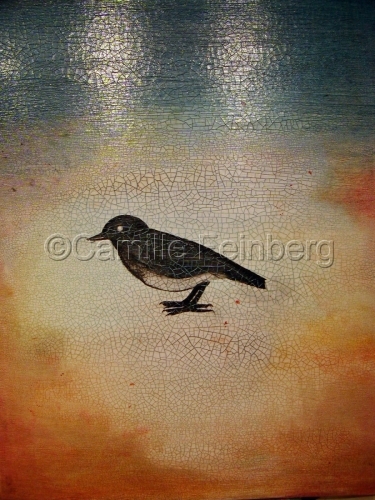 She paints songbirds and sparrows, water birds and mockingbirds, and she paints doves. She speaks of her art as an expression of her faith. 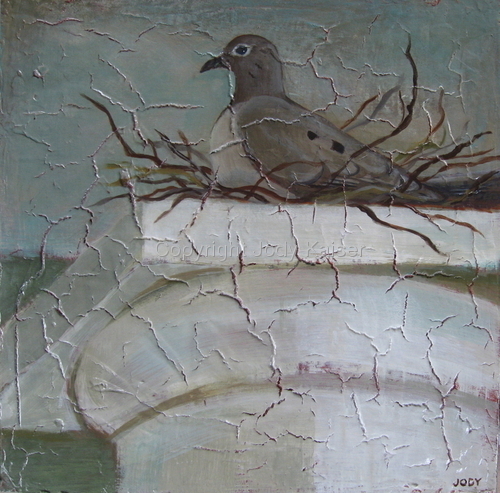 Her paintings of doves impart a living breathing strength to an enduring symbol. A glimpse of bright feathers in the bushes. A sense that some flashing bright thing is beyond our grasp. We can’t fly like a bird, but for centuries we’ve tried to capture them in painting and photographs.